Jack will be working out and playing some baseball with the Walbeck Elite 18U team in June. Given the fact that he gone most of July and the team is carrying a bushel of outfielders/pitchers, I am not sure how many at bats he is going to get. I am just grateful that he is getting a chance to work-out and get a few at-bats. 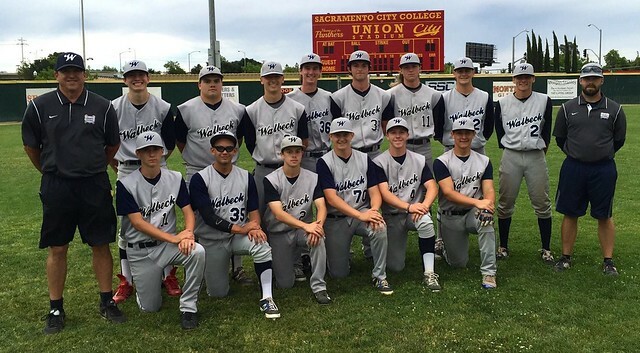 The Walbeck Elite 18U played the SC Cats at Sac City in their first game of the summer season. At the plate, Jack was 0 for 1 with a strike-out, a walk and a run scored. Subbing into right field in the sixth inning, Jack walked on five pitches. He went to second on a wild pitch, to third on Whitney's walk and scored on a wild pitch. Jack came to bat again in the seventh inning. He struck out swinging on a full count to end the game. Jack was also a courtesy runner for the catcher twice. He got caught stealing the second time. In the field, Jack played the bottom of the sixth in right field. He didn't have a put-out or an assist. The Elite lost to the Cats by the score of 9 to 7. The box score is here. For the summer season, the Elite have a record of 0 wins and 1 loss. The game log is here.